Cowboy Boots & Dress /Comfort /Vintage Shoes! 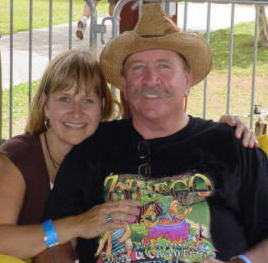 Ceezees.com began as an idea born out of a passion for Cajun French music and our love of dancing. I have been Cajun dancing for just over a decade and a half and have no direct Cajun heritage, of which I am aware, except by proxy. I can now say that Cajun blood flows freely through my veins and drives my desire to promote the Cajun culture that could easily die with the passing generations. The family values that are so integrated in the Cajun Culture can revitalize our community, if we would only embrace them once again. Including our children in our festive events can only increase the camaraderie of the family, and in turn have an impact on the community in which we reside. Our Cajun predecessors would include their offspring without fail when attending the community Fais Do-Do. Therefore, we hope to encourage as many people as possible to become honorary Cajuns, if not already graced with Cajun heritage, and embrace their Cajun beliefs and values. Celebrate with us and learn of "Les Joi de Vie" through Cajun and Zydeco Dance and song. Help us support Cajun and Zydeco musicians, by buying the CDs and attending their dances. Note: When you buy a CD at a dance the Artists get more benefit from the sale. We are Mike and Liz Humphries. We met at a CFMA sponsored dance at the FOP hall in Baton Rouge back in March of 2003. 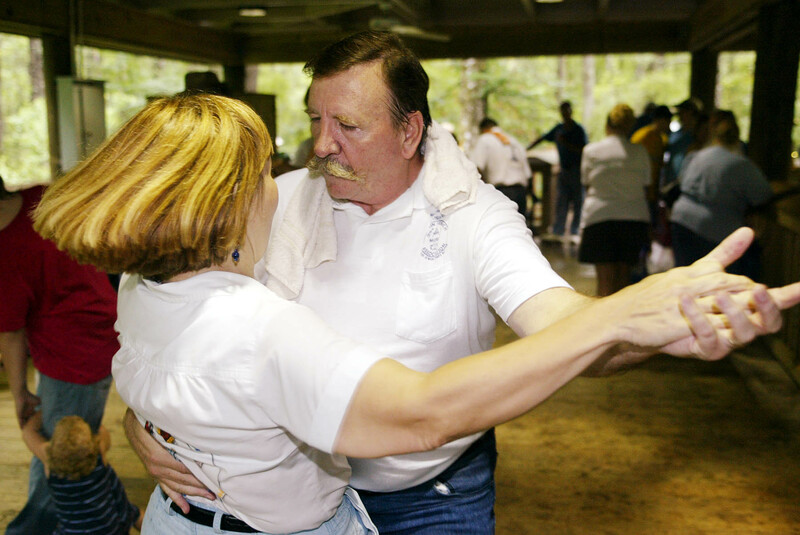 On February 14, 2004, we "jumped the broom" in the presence of a few hundred dear friends and began our life together sharing our common love of Cajun and Zydeco music through dancing and teaching. 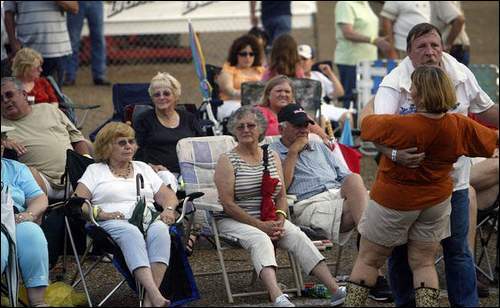 We also attend as many Cajun and Zydeco Festivals as humanly and financially possible. One Sunday while talking with Ray Abshire under the shade of a magnificent Live Oak on the grounds of the Old state Capitol Building, just before he was going on stage at the FestForAll in Baton Rouge, we discussed 'credentials' and how each of us are out there doing our part to help bring awareness and attention to the culture of some of the first settlers to Southwest Louisiana. His credentials are a long list of awards, and places where he has successfully brought his Traditional Cajun Music to others across our United States. Our credentials are a modest few festivals scattered across time, and several states . But we both share a passion for the music, language and especially the people that have descended from the Acadians that were exiled from Nova Scotia so many years ago. Neither of us would ever want to witness the demise of this beautiful part of Louisiana Heritage. Please help by preserve this culturally rich heritage by buying music from Louisiana Cajun, Creole, and Zydeco artists! Also, visit Cajun Southwest Louisiana in the spring summer & fall and attend one of the many festivals that feature the music, food and crafts of the Cajun peoples! The interest is there! Tens of thousands of tourists visit every year, many come to dance! This is where we hope to help! We offer lessons, both classes and private lessons to one or many visitors. My main page provides information regarding the classes, and for private lessons, but if I don't have what you need specifically, call, message, or write to let me know your specific needs and how we can help facilitate a visit that is full of 'le joi de vie' (the joy of life- though-be-it somewhat slang)! You can now find us at any Lafayette area Cajun or Zydeco music event and if there are none in the area of Carencro, then we are driving to where we can dance to Cajun or Zydeco Music. The Spring and Summer seasons is blossoming with Louisiana Festivals that feature our Cultural music, food and crafts. Make a commitment to go and visit a festival that you have never been to this year! Meet some new friends, Learn to dance, if you aren't already on the floor, and support the bands. During the spring, summer & fall months we offer Zydeco dance classes to prepare more interested persons with the tools necessary to have their fun ON the dance floor, and not necessarily on the sidelines watching others experience the joy. Check our main page for details. Thanks for visiting our website, Dance instruction available. For more information click » Mike and Liz ZydeCajun Dance Lessons please use the @ symbol for success.